Rough Crafts is a Taiwan-based studio that specialises in building handmade objects such as furniture, street art and of course motorcycles. 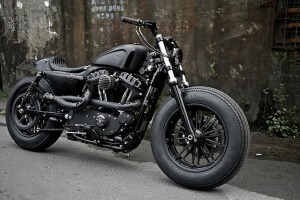 Gaining more traction in Europe and the USA for its unique motorcycle designs, Winston Yeh is the man behind Rough Crafts’ latest design, the Bomb Runner, which features a dark-iron motif that is given weight via the chunky rubber matched to Rolad Sands Design wheels. Harleys are meant to go cross-country on, but the Bomb Runner by Rough Crafts’ Winston Yeh is just begging to burn the city streets. 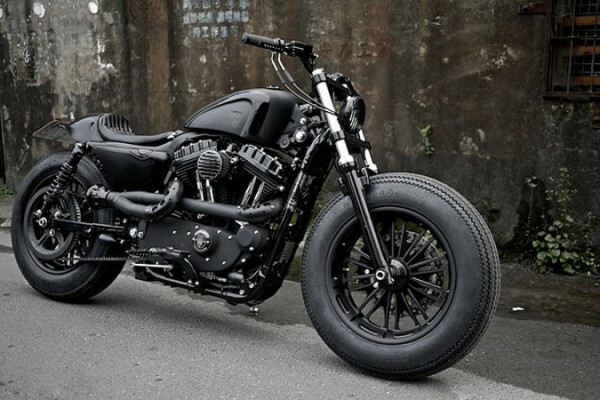 Built on the 2011-model Sportster Forty-Eight 1200, the Bomb Runner brings a more menacing look to the table, with a higher rear shock and tail section and lean-forward look. Most of the components are Rough Crafts’ own, including the tank and fenders, rocker and clutch covers, and 2-into-1 exhaust system. Keep in mind, there are a few places this bike should never be taken, including Pier 1, JC Penney, and any frozen yogurt shoppe.